If there's something editors are hungry for right now, it's middle-grade contemporary fiction with strong characters and voice. And boy, does Mary Penney have it in spades! Her first novel, ELEVEN AND HOLDING, just sold to Kristen Pettit at HarperCollins, and you just ache along with Macy, the main character, as she resists all the change in her life with everything she has. Turning twelve is the last straw for Macy. It means she'll be going to junior high without her best friend, who's a year younger. Add that to the death of her beloved grandmother and the loss of the cafe that Nana owned (Macy's home away from home), the fact that her father, a soldier, is back from the Middle East and yet is still mysteriously "away" somewhere, and the way Macy's relationship with her mother has gone from understanding to adversarial, and it's just too much to bear. Macy determines to find her father and bring him home to the family that needs him, but soon finds that all the people who she's cast in very black and white roles in the drama of her life begin to resolve, as they do for so many of us at this tender age, into shades of gray, and that the truth is found in letting herself continue to grow up. Huge congratulations to Mary for finding such an enthusiastic home for Macy! 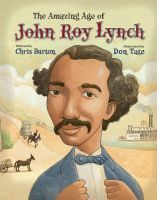 Roll on over to Mr. Shu Reads for the cover reveal of Chris Barton's newest book, THE AMAZING AGE OF JOHN ROY LYNCH, illustrated by the great Don Tate. This is the inspirational story of a fascinating historical figure and era. Look for it in stores April 1st, 2015. Congratulations, Chris and Don! If you know Audrey Vernick, you know what a huge baseball fanatic she is. ("Huge" being metaphorical, not literal.) And Audrey's baseball books have all been home runs, especially her picture book biographies of Effa Manley (SHE LOVED BASEBALL) and the Acerra family (BROTHERS AT BAT). You can see where this is going, right? Yep, there's another Audrey Vernick baseball book underway! 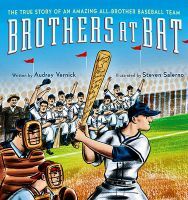 Audrey will reunite with BROTHERS AT BAT illustrator Steven Salerno and editor Jen Greene at Clarion for WITH A BASEBALL IN HER HAND, a new picture book biography about a female baseball phenom who won spectators' hearts in the 1930s much the way Little League superstar Mo'ne Davis has today: Edith Houghton, who joined the professional women's team the Bobbies at the age of 10. Just WAIT until you see Edith's face under the too-big baseball cap in the too-big uniform! It's priceless! Congratulations, Audrey--another home run is underway! Kevan Atteberry, author-illustrator. It has a nice ring, doesn't it? 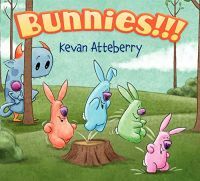 Kevan has illustrated many successful books, including FRANKIE STEIN and TICKLEMONSTER, but his very first book as an author-illustrator, BUNNIES!! !, will debut in January, and we can't wait! You will adore it, we promise! When we announced the deal for BUNNIES!! !, it was for two books, and now we know that the follow-up is PUDDLES!! !, featuring the same characters as BUNNIES!! !, coming out in summer 2016. Aaaand...there's more! We've just done another deal with Kevan's BUNNIES!!! editor, Jill Davis of Katherine Tegen Books at HarperCollins! 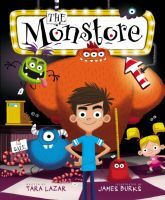 Kevan's third book as author-illustrator also features a monster, but this time it's a different monster--two, actually--a parent and a child. I LOVE YOU MORE THAN THE SMELL OF SWAMP GAS turns the classic parent-child love poem on its head. For the acquisitions meeting, Jill coined the term "macho mushy," which we love! I LOVE YOU MORE THAN THE SMELL OF SWAMP GAS is slated to come out summer 2017. A Third Star for MORTAL HEART! We're happy to announce a third star for Robin LaFever's MORTAL HEART! This time Booklist Online had great things to say about the whole His Fair Assassin trilogy. They say, "using both religious and political history of the late 1400s, [LaFevers] has created a trilogy strongly grounded in reality, full of political intrigue and the stench of battle, yet stretched enough to give mysticism its due. Perhaps more important, she offers readers worthy heroines: fair assassins whose emotions and choices are as rich and complex as their fearsome abilities." Look for MORTAL HEART on Tuesday when it's available in bookstores everywhere. Congratulations, Robin! There's a song I knew from camp that has a way of getting in your mind and staying there awhile: "The Cat Came Back." No matter how many ways Old Mr. Johnson tried to get rid of that cat, it just kept coming on back. We have no desire whatsoever to get rid of the rascally Cat from Deborah Underwood's NYT-bestselling HERE COMES THE EASTER CAT—in fact, we're pleased as punch to say that not only did HERE COMES SANTA CAT come out earlier this week, but HERE COMES THE TOOTH FAIRY CAT will come out next year—and now we've wrapped up a new deal for Cat #4: HERE COMES VALENTINE CAT, to be released in time for Valentine's Day 2016! I wish I could properly express how very much I wish you could all see TOOTH FAIRY CAT right now, and how happy I am at the brainstorming going on for VALENTINE CAT. Deborah has a terrific way of taking the established format and twisting it just enough to give us new insight into our dear Cat, and give him new foils to play off of, and make us say "Aww!" just the right amount—and the rest of the team, illustrator Claudia Rueda, editor Jessica Garrison, and all the design and marketing folks at Dial, is spot-on with their collaboration and their continued celebration of this character. In fact, Deborah recently recorded the narration for audiobook versions of EASTER CAT and SANTA CAT, and every week, book trailers are being storyboarded and sly, winking ads are being developed. It seems like Cat is always with us through our workdays, and what could possibly be better? Huge congrats, Deborah, on this latest deal and all the exciting new Cat things underway! There Once Was a Great Cover! How about a cover reveal for your Friday? 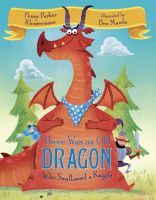 Penny Parker Klostermann's THERE ONCE WAS AN OLD DRAGON WHO SWALLOWED A KNIGHT has a chubby, adorable dragon adorning her bright and cheery cover illustrated by Ben Mantle. It's it great? Click the link to read all about the cover's story on EMU's Debuts. Congratulations, Penny! Princess Juniper Leaps to Life! It's full of purple beauty! It's royally sweet! And it's an exciting, middle-grade adventure! Take a peek at the gorgeous cover of Ammi-Joan Paquette's first book in her new series, PRINCESS JUNIPER OF THE HOURGLASS. Don't you love it? We can't wait for this one to come available summer 2015. Congratulations, Ammi-Joan! All right, how many of you have your own copies of THE MONSTORE? (If not, what are you waiting for? It's the perfect time of year for this baby!) Those of you have already read this quirky and charming picture book have some idea what a fabulous storyteller is our own Tara Lazar. And that's further illustrated by the great list of forthcoming picture books marching along toward publication. Is that enough, good People of the Internet? No, IT IS NOT! I'm thrilled today to announce a brand new picture book deal for Tara Lazar. WAY PAST BEDTIME is yet another hilariously quirky, tongue-in-cheek story about a little boy who has had enough of being packed off to bed while his parents stay up and have all the fun. He's determined... no matter what the cost!... to expose what REALLY goes on Way Past Bedtime. This fabulous new book-to-be has sold once again to Alyson Heller at Aladdin. Be on the lookout for it in Fall 2016. Hooray, Tara! Happy release day to Deborah Underwood and the second, subversive holiday escapade of Cat in HERE COMES SANTA CAT! First Easter and now Cat's after Christmas--what fun! Look for your copy today to find out why Cat's reviews have more stars than a Christmas tree and high praise follows him wherever he goes. Here's hoping him into many reader's hands with his new, red suit! Congratulations, Deborah! We're delighted to roll out Liz Garton Scanlon's cover of her middle-grade novel, THE GREAT GOOD SUMMER. Illustrated by the one and only Marla Frazee, it's a gloriously perfect match of art in words and picture. This will definitely be a book you'll want to check out when it releases May 5th, 2015. Congratulations, Liz! In case you've missed it, take a gander at the bright and shiny cover of Tara Dairman's second middle-grade novel, THE STARS OF SUMMER. Look for it in bookstores May 5th, 2015 from Penguin! Congratulations, Tara! Release Day for SCHEMER and ATTACK! BOSS! It's a double book birthday today for two great Austin authors! 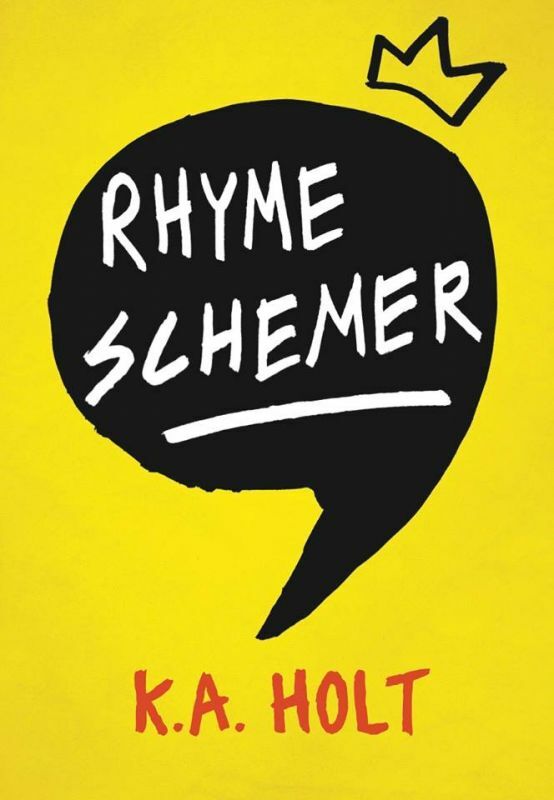 First, happy, happy book birthday to K. A. Holt and her lovely novel-in-verse, RHYME SCHEMER! Pick up your copy today to find out why Kirkus Reviews calls it a "transformative tale". Second, happy release day to best-selling author Chris Barton and his fun picture book, ATTACK! BOSS! CHEAT CODE! : A GAMER'S ALPHABET. 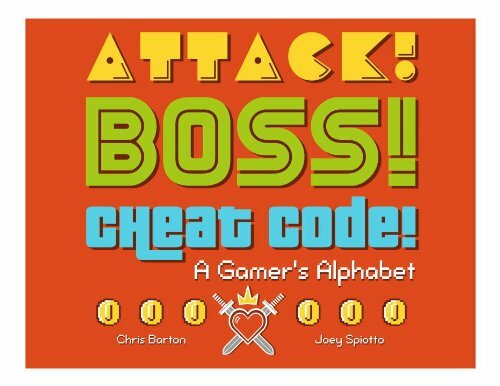 This is not your everyday ABC book, but rather an indispensable guide to the lively language of video games. A must for the gamers in your life! 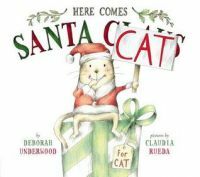 It's another starred review for Deborah Underwood's HERE COMES SANTA CAT! School Library Journal says "readers will enjoy the playful exchange between the narrator and Cat, the expressive full-color ink and colored-pencil cartoonlike illustrations, and the nicely resolved ending." We agree and can't wait for the book to hit shelves this month on the 21st. Congratulations, Deborah! Accolades are already starting to roll in for Lynda Mullaly Hunt's A FISH IN A TREE, due out in February, and her first novel, ONE FOR THE MURPHYS, has a long string of notices as well, most recently inclusion in the Global Read Aloud that began this week. Her fans will be thrilled to know that a third middle-grade novel is on the way! As yet untitled, the new story features Darlene "Baby" Clemens, who has seen the return of a long-missing parent, and who learns to shake off the dream of the perfect life to appreciate what she already has. She realizes that the people we love may not be exactly what we wish but we love them anyway. Nancy Paulsen of Penguin's Nancy Paulsen imprint, editor extraordinaire of Lynda's first two books, has also signed this latest project, which is scheduled to release in the second half of 2016. NOT IN THE SCRIPT is out in the world! It's a happy book release day for Amy Finnegan's debut novel, NOT IN THE SCRIPT! So, yes, it's out in the wild and you can pick up your copy today to find out why School Library Journal calls it "realistic and relatable" and why the main character's "wit and humor will keep readers with her right until the end". Congratulations, Amy! Here's wishing it into reader's hearts everywhere! Deborah Underwood's PART-TIME PRINCESS came out last year, and sure, it's pink and princessy--but the definition of "princess" is a bit subversive. 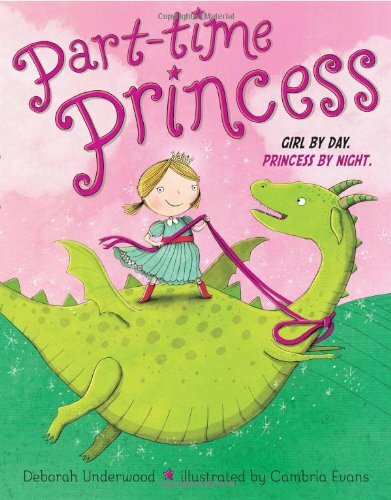 As Booklist said, "A real princess, we learn, can slide down a fire pole in a frilly skirt, lasso a dragon and invite him to tea, play leapfrog with frogs in the Royal Mud Puddle, and be the hit of the Royal Ball—where, of course, she meets a handsome prince. 'Maybe I'll marry him when I grow up,' she says. 'But right now I'm too busy.'" So it's not a huge surprise that it hit a bit of a nerve and has found such a solid audience that a companion book was in order! Thus we are pleased to announce that Kevin Lewis at Disney-Hyperion has just signed PART-TIME MERMAID, again with the terrific Cambria Evans to illustrate. As you might expect, Deborah's take on mermaids is equally subversive. What a thrill it is to see our clients' books globe-trotting and book club visiting! Here are the latest sub-rights deals we've celebrated since fall. Bookspan's Book of the Month Club has acquired the hardcover rights to ALL FOUR STARS, thanks to the rights people at Penguin Random House. OTHERBOUND is a 2014 Junior Library Guild selection. We're grateful more copies will be available to readers! Thanks to a deal from Rights People, WILMA RUDOLPH: OLYMPIC RUNNER is available in Japanese via Choubunsha Publishing Company, Ltd.
A TASTE FOR RED is now available in French from Editíons Flammarion/Pere Castor, thanks to Rights People. Thanks to the sub-rights team at Penguin Random House, Verlagsgruppe Random House GMBH acquired the German rights to ONE FOR THE MURPHYS. The His Fair Assassin trilogy is now available in Polish via Fabryka Stów and complex Chinese via Sharp Point Press all thanks to the folks at Rights People! And the audio edition by Recorded Books is now available in the UK, not just the US, thanks to the sub rights team at HMH. Scholastic School Book Clubs signed up BLACK RADISHES, thanks to the sub rights staff at Yearling. BLACK RADISHES will also be available in Chinese through Liaoning Children's Publishing House, thanks to the Rights People team. SOPHIE'S SQUASH will be available in Korean by Awesome World and French from Editíons Kaleidoscope, thanks to the Rights People team. Thanks to Rights People, JOHNNY DANGER, Book 1, will be available down under from Penguin Australia. CHASING THE MILKY WAY will be published for Scholastic School Book Clubs thanks to the sub rights staff at Philomel. Also, CHASING THE MILKY WAY will be available in Brazil with Portuguese rights sold to Novo Conceito via Rights People. THE FALSE PRINCE will be published in Bulgarian by Ciela Norma and Thai by Nanmee. Also, THE RUNAWAY KING will be published in Bulgarian and Thai by the same respective publishers and THE SHADOW THRONE will be available in Bulgarian by Ciela Norma as well. Thanks to the sub-rights team at Scholastic for making this possible! Thanks to the licensing folks at Candlewick, we're happy GHOST IN THE HOUSE will be available in paperback in Scholastic Book Clubs everywhere. And thanks to the folks at Random House, Scholastic Book Clubs and Fairs will also be carrying PARADOX! GO TO SLEEP, LITTLE FARM will be available in audio format via Recorded Books, thanks to the sub rights staff at Houghton Mifflin Harcourt. IF YOU'RE READING THIS is a 2014 Junior Library Guild selection. We're grateful more copies will be available to readers! ALL THROUGH MY TOWN has been published for Scholastic Book Clubs, thanks to the staff at Bloomsbury Children's. NERVE Italian rights have sold to Newton Compton Editori and US audio rights to Blackstone Audio. Also, CHARISMA, will have Dutch rights available via Uitgeverij van Goor, an imprint of Uitgeverij Unieboek/Het Spektrum BV. All thanks to the sub rights staff at Penguin Random House. Thanks to the rights agent at Sourcebooks, THE DIRT DIARY and THE PRANK LIST will be available with a Scholastic Book Clubs edition in the USA, New Zealand, and Australia. BE A CHANGEMAKER: HOW TO START SOMETHING THAT MATTERS and EMMANUEL'S DREAM: THE TRUE STORY OF EMMANUEL OFOSU YEBOAH are 2014 Junior Library Guild selections. We're grateful more copies will be available to readers! DIRT BIKES, DRONES, AND OTHER WAYS TO FLY is a 2014 Junior Library Guild selection. We're grateful more copies will be available to readers! PALACE BEAUTIFUL is available in simplified Chinese from Aurora Publishing House, thanks to the Rights People team. Thanks to Rights People, RETURN TO THE WILLOWS will be available in China from Beijing Yuanliu Classic Culture, Ltd and in Taiwan via Mandarin Daily News. We appreciate our colleagues who make these sales happen—and especially for our clients who write great books all of us want to get into reader's hands. Thanks for all your hard work! 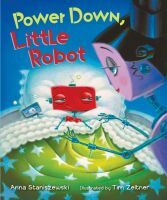 Today we're excited to show off the bright and brilliant cover of Anna Staniszewski's first picture book, POWER DOWN, LITTLE ROBOT! Isn't it sweet? Illustrated by Tim Zeltner, look for this one from MacMillian on March 3rd, 2015. Congratulations, Anna! It's a second starred review for Melanie Crowder's AUDACITY! This time it's from Kirkus Reviews. They say, "Crowder breathes life into a world long past and provides insight into the achievements of one determined woman." They praise it as "compelling, powerful and unforgettable." And these are just a few of the wonderful things they mention. Look for this novel in verse to hit shelves January 8th, 2015. Congratulations, Melanie!